Hi there and happy Friday! I don't know about you, but this past week drug on like it was two weeks long. But I'm kicking it to the curb today. I did finally get the binding on my Snapshots quilt! Good thing it felt cold and chilly, perfect for handwork. I'm pleased with how it turned out. And I'm extra pleased seeing how much money was raised for the St. Jude's Children's Research Hospital. Great job everyone! Next years quilt along has already been announced, and you can read about it here over on the Jolly Jabber Blog. 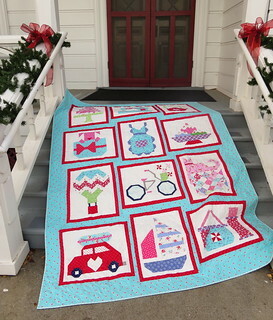 It features a lovely quilt designed by Joanna of Fig Tree Quilts and featuring Strawberry Field Revisited, her line of fabric due in stores the first of the year. There are lots of fun people sewing along, so go check out the list! 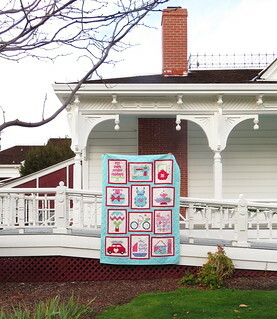 I love, love, love your quilt Pam! This has been such an awesome quilt along! Extra special and joy filled. Love your version, your fabrics are so pretty. I hope that you'll have something new for next year. I have used up most all of my pretty pkm stash. 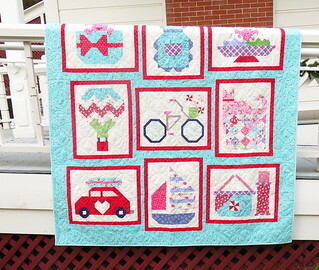 Just love your quilt and the background blue you used in between all the beautiful snapshot blocks! What! Your not sewing along? BTW, your house is beautiful! Your quilt is sew sweet. Love it. The fabric and colors are perfect.